The Gregory Residence is a masterclass example in design. Furnished by renowned New Hope woodworker George Nakashima, this private and rustic home offers ingenious versatility over its 1,644 square feet of space on a 10-acre lot. 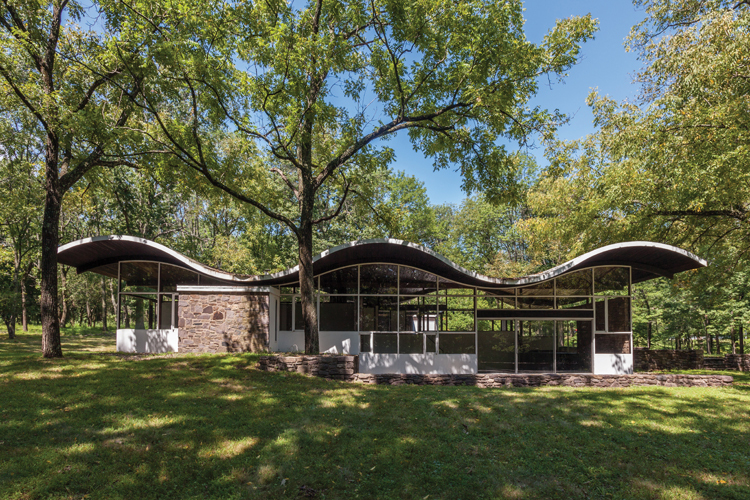 The first commissioned work by "star architect" Charles Gwathmey after his seminal Gwathmey Residence and Studio, the widely published Sedacca House is a two-bedroom modernist "living sculpture." Fully original and modernized in consultation with Gwathmey, the home features unique design elements that execute a complete the geometric composition. Distinguished as the only home in Houston designed by Frank Lloyd Wright, this masterpiece is an art collector's paradise. Ideal for both casual living and grand entertaining, this private residence features multiple art galleries, high ceilings, geothermal temperature system and the original built-in furniture. Built into the side of a bluff on almost two-acres in the secluded wooded community adjacent to Door Bluff Headlands County Park, this mid-century modern home was designed by Wisconsin Architectural Hall of Fame green pioneers Willis & Lillian Leenhouts. The ultimate retreat, this mid-century modern masterpiece features a main house, separate guest house and three-car garage. Luxurious mahogany finishes can be found throughout the interior of the home in addition to dramatic main rooms and a gourmet kitchen built by Boffi in Italy. With design aesthetics akin to the mid-century modern movement in the united states, this exceptional home is perched atop the iconic Queenstown Hill and boasts incredible views. Complete with meticulously manicured grounds, five spacious bedrooms and a fully equipped modern kitchen, this residence is quintessential Queenstown living. Brilliantly designed by architect James E. Norman, this home is striking and one-of-a-kind. The rock wood-burning fireplace, curved rock wall entrance and exposed post and beam construction all lend themselves to defining this mid-century modern's wholly unique style. Designed by renowned Washington architect Robert Gurney, this home is a modern interpretation of historical revivalism. It spans over 8,000 square-feet and includes six bedrooms and five and a half bathrooms. A functional residence boasting artistic architectural details, this mid-century modern home was designed by architect Mark McInturff. The property features a main house, detached guest house, garage, heated snow-melt driveway, and outdoor infinity pool. Built in 1985 by architects Jeter, Cook and Jepsen, this mid-century modern home enjoys thrilling views of Lords Cove, Calves Island and the Connecticut river through brilliant glass walls. Sprawling almost 6,000 square feet, this is a truly exceptional residence with a wide array of amenities. From New Zealand to New Jersey, discover midcentury-modern homes from a range of iconic architects, presented by Sotheby's International Realty Affiliates LLC.